I am determined to bake cookies today doggonit. I have depleted my inhouse supply and I need to bring them to at least two functions happening this week so today is the day. In fact, I will be doing a lot of make ahead cooking today. Not in a highly organized got-a-month's-worth-of-meals-cooked-and-ready-at-any-moment kind of way but in a I have A LOT of produce that needs to be used way. Plus, it would be nice to be able to just grab and go as far as sides are concerned for this week's dinners. This past weekend we went to the Roy Clark concert which was enjoyable. It would be very easy for one to get used to attending concerts every weekend. ;) This weekend though holds a Houseparty, a coupon class, a bird banding, and a concert - lots of fun. 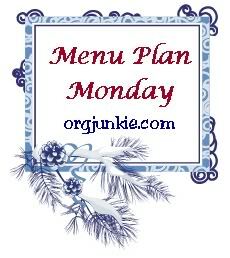 We are in East Texas between Dallas and Tyler.Your menu for the week looks great. I would really love the Chard and Onion Tart. We still have really nice Rainbow Swiss Chard in our garden. Thank you for sharing and you have a great week. Well Miz Helen, nice to have you back. :) Our chard is not doing so well. We planted it from seed not too long ago but I think the nearby eggplant overtook the seedlings and blocked out the much needed sun. Although, it took the brunt of the frost as well. I am hoping to get some out of our garden as well as from the CSA. The chard form the CSA is plain ol' Swiss chard but the kind we planted was called "Neon Lights" and is supposed to have fabulous color on the stems. Thanks for stopping by and have a great week! Oh..the Chard and Onion Tart sounds amazing!!! I am always looking for things to do with chard! Thanks for sharing. Thanks Annett for dropping in! I am telling you, that www.riverford.co.uk website is a treasure trove of gorgeous recipes!